Originally produced December 2016. Research and writeup by Young Phong. Public libraries in the United States and elsewhere in recent times have become increasingly important places for immigrants and refugees seeking information about resources and services that might be available to them, information about citizenship, books to learn the language of their adopted country, or simply just a safe place to feel welcomed. Providing information services and a welcoming environment to people from different backgrounds and walks of life is nothing new for public libraries, as their core mission has always been one about equitable service, equal access, and inclusiveness (these ideas being firmly established in many libraries with the founding of the American Library Association in 1876). However, to what extent a library was willing to open its doors to all people or whether or not these aforementioned ideas were actually put into practice was sometimes based in large part on the community and the milieu in which the library operated. In the late 19th and early 20th centuries, many immigrants were viewed as outsiders and diversity (in the ethnic sense) was a fairly new concept that had yet to be fully accepted by American society. Many libraries at that time were not readily accessible to immigrants and non-English speakers because they did not have collection materials and services that were specific to their needs or staff that could communicate with them in their native tongue. Sometimes, unfortunately, it was simply because of prejudice and an “us and them” attitude. There were, however, a few libraries—particularly in California and New York—that did offer foreign-language materials to non-English speakers and services that catered to them. Some of these libraries were even specifically designed to help immigrants. One such library that opened to serve the immigrant community in the early 1900s was the Pasadena Public Library’s own Foreign Branch. Opened on February 13, 1920, the Foreign Branch was designed to serve foreign-speaking readers and the immigrant community; its collection included over 400 books in English, Italian, Spanish, French, and Japanese (Cain & Zorbas, 1982). The library was located in the Garfield School, and it was sometimes called the Garfield Foreign Branch for that reason. This location was very ideal since the school was located in an area of Pasadena that was home to many Chinese, Japanese, and Mexican immigrants, many of whom sent their children to the Garfield School. Moreover, the Library had had a working relationship with the school prior to installing a branch there. In 1917 it started placing books in the Garfield School so that residents in that neighborhood would have easy access to the library during the summer months. The Foreign Branch was in operation until the Depression reduced the operating hours of the Pasadena Public Library and permanently closed the branch. There is no record of when it closed, but it may have been between 1929 and 1933; the former date being the start of the Great Depression (according to historians) and the latter was the date the Long Beach earthquake occurred and caused damage to a number of structures in Pasadena that included the Garfield School. 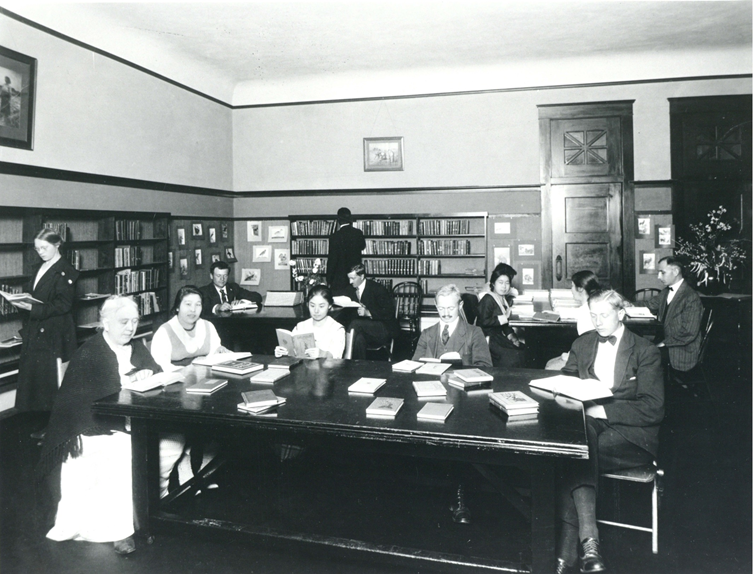 For its time, the Garfield Foreign Branch was a very forward-thinking concept; its collection and the services it offered in many respects exemplified the progressive policy of the Pasadena Public Library during a period of American society that had yet to understand or embrace diversity. While the Foreign Branch may just be a footnote in PPL history, its mission and the service it provided have had a lasting effect on how the Pasadena Public Library operates in its own community and the library community at large. Today, the Branch’s mission to reach out to and serve all members of the community still lives on in the Pasadena Public Library. All of its libraries have in their collection some foreign-language materials, language-learning resources, and books on obtaining American citizenship. Branches such as the Hill Avenue and its sizable Asian-language collection and Villa Parke and its service to the Spanish-speaking community pay homage to the Foreign Branch. Garfield to open as night school. (1922, September 9).Pasadena Star News, p. 13. Libraries may be open in summer. (1917, April 21).Pasadena Star News, p. 13. Scheid, A. (2006). Downtown Pasadena’s early architecture. Charleston, SC: Arcadia Publishing.